서울 드랙 퍼레이드와 홍대 마익스 케빈이 협업을 하여 준비한 파티, 헤븐에 여러분을 초대합니다. 홍대의 새로운 베뉴에서 LGBTQ+ 커뮤니티와 앨라이에게 안전한 공간, 그리고 새로운 바이브, 멋진 음악와 드랙, 벌레스크 공연으로 가득한 밤을 선사해 드리겠습니다. 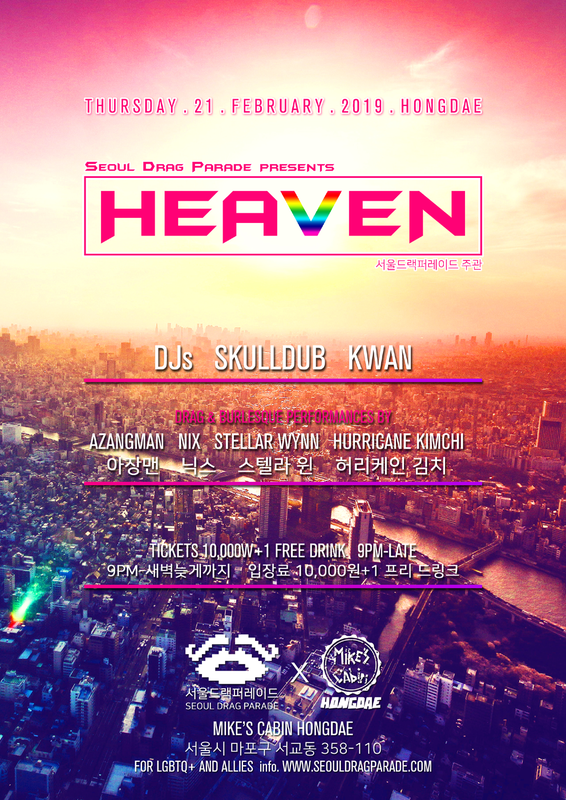 We are inviting you to a brand new party for LGBTQ+ and allies in Hongdae, Heaven. Seoul Drag Parade and Mike's Cabin Hongdae have been working together to offer LGBTQ+ community and allies a safe space, and a great night full of new vibes, great music, drag and burlesque performances, at this new fantastic venue in Hongdae. - LGBTQ+ 커뮤니티와 앨라이를 존중하지 않는 행위, 위협이 되는 행위는 허용되지 않으며, 발각시 즉시 퇴장조치 합니다. - 헤븐에는 성별 구분 없이 사용이 가능한 성중립 화장실이 준비되어 있습니다. - 입구에서 신분증을 반드시 제시해야 하며, 미성년자는 입장이 불가능합니다. - Any disrespectful behaviours toward LGBTQ+ community and allies are not allowed. Person who breaks this rule will be immediately removed from the venue. - Heaven provided you a gender-neutral bathroom throughout the night. - You must show your ID at the door, and minors are not allowed in.